1. Maintain a supply of fresh batteries as well as candles and matches. You’ll need the latter to find the batteries in the dark! 2. Keep flashlights handy: both the hand-held kind and larger lanterns. 3. To prepare for the eventuality of a lengthy outage, such as the Cape May and Northern lake areas of New Jersey experienced this past winter, stock your kitchen with a few days’ worth of non-perishable potables. Peanut butter, crackers, sardines, dry milk, bottled water, cereal, granola bars, cans of ready to eat soup, and nuts will stave off the hunger pangs. Many of these foods contain protein: a nutritional must. You may want to toss in a few chocolate bars. I don’t know about you, but power outages make me nervous and chocolate calms the nerves! 4. Don’t forget about your furry, winged, or scaled family members. Be sure that their nutritional and other needs, such as fresh litter, can be met. 5. With a portable radio, you can get the latest updates concerning the emergency. When I was a kid growing up in New York, I lived through an historical night. One very hot late spring day, the city got slammed with a major blackout never before seen. With the fans inoperable, I took my transistor radio — the only one on the block — onto my stoop, and the sound soon enticed the neighbors to gather round. The news kept us informed and the music kept us happy. Because of that little radio, a frightening experience became tolerable: an impromptu neighborhood get-together. 6. If you can purchase a portable generator, you’ll be glad that you did. 7. Keep your cell phone nearby and charged, in case you encounter a serious problem. 8. If the blackout occurs in the winter, you will have no heat. Stay indoors, layer your clothing, and capitalize upon safe, portable heaters. Keep your blood circulating to create internal warmth; get up and walk around the house. When it’s time to hit the hay, cuddle up with your partner to generate body heat, and take your pets into the bed with you. Even if you don’t do this on a regular basis, do it during a power outage to ensure that your beloved animals are safe, too. 9. Unless your life is truly in jeopardy, do not start a fire anywhere other than in your fireplace, and follow all the usual safety precautions — including having a chimney sweep clean your chimney annually. My friend’s mother once set fire to her condo because she had pooh-pooh’d the services of a chimney sweep; she thought them an unnecessary expense. The accumulated soot sparked the fire. Thankfully, no one was injured, but please, don’t follow my friend’s mom’s example. 10. During flood season, don’t drive or wade through standing water. You have no way of knowing how deep it is. And if you think you don’t live in a flood area, think again. The changing weather patterns put us all at risk. Five years ago, I lost half of my house to Hurricane Dennis, and I do not live in a flood zone (link to my article, please, re the flood and insurance). 11. Stay in a safe place so as not to endanger yourself by way of falling trees and lightning. In February of 2010, a man living in East Brunswick, New Jersey lost his life during one of the season’s awful snowstorms. He mounted his snowplow to clear his property, as he did whenever snow reached a considerable accumulation. Heavily weighted with snow, the branch of large tree snapped and killed the poor soul. His was not the only life lost in this manner during these storms. 12. In the much-publicized return of Luke and Laura on the popular soap opera General Hospital, viewers learned that their heroes kept a special duffle bag handy for quick getaways. Allow life to imitate art. If you should be forced to evacuate, keep such a duffle bag packed. Pack it with some cash, proper ID, a change or two of clothing, medications you may need for a few days, toiletries, your house keys and a list of phone numbers of people you may need to contact. Take some canned food for your pets as well as your insurance information, in case there is too much damage to get back into your home. 13. Keep your gas tank full. In a true emergency, when you must literally outrun Mother Nature, there will be no time to stop for gas. At 3 AM on that fateful day in August 2005 before Hurricane Katrina hit New Orleans, Taylor Hicks, who was there for a friend’s wedding, flagged down the city’s last remaining cab. Talking fast, he somehow convinced the unwilling driver to take him to a place of safety: West Monroe, Louisiana, where the airport was operational. Taylor lived to fly to Las Vegas, audition for American Idol, and be crowned that season’s winner. He may not have, had the cabbie been low on gas. 13. Sit your family down to discuss how important it is to stay together and remain calm during an emergency. When former New York City Mayor extraordinaire Rudy Guiliani was growing up in Brooklyn, his father stressed the importance of remaining calm during a bad situation. He had told the boy, “In a real emergency, everyone will panic. In the midst of the chaos, there will be one person who will keep his head, and that person will lead the others to safety. You be that person.” Indeed he was, during New York City’s most horrific crisis: 9/11. 1. Know where your circuit breakers are located, as well as the shut-off valves for your water supply. 2. Keep a fire extinguisher on each floor of your home. 3. Check your smoke detectors regularly to ensure that the batteries are still working. 4. Have carbon monoxide detectors installed. Many of us have heard the true tales of cats who roused their groggy humans to warn them of carbon monoxide leaks. Even if you have a kitty in the house, the toxic gas can get to her as well. Play it safe and install those detectors! 5. Check your sump pumps on a regular basis. Be sure there are no obstructions in the well and ensure that the machinery is functioning properly. In the event of a horrendous flood, a back-up sump pump installed properly ahead of time is well worth the investment. Provided you don’t lose electricity (as I did during Dennis), the extra pump will circumvent a great deal of property damage. 6. If you smell gas, don’t call the utility department from your home as minutes and even seconds count. The bakery four blocks from where I’d once lived blew up one day, because of a gas leak. I didn’t realize what it was, at first. The blast hit with such a force that, even four blocks away, I thought an intruder was trying to break down my door! If you suspect a leak, flee the house immediately. Use your cell phone to call your provider, or go to your neighbor and use his phone. 7. If a fire should break out in your home and it’s large too put out with an extinguisher, call 9-11 immediately and leave the house. 8. God forbid, if someone in your household or a pet should catch fire, roll him or her on the floor in an area rug to tamp out the fire. 9. Learn the Heimlich Maneuver so that you can save the life of a loved one who is choking. If at all possible, get certified via a CRP/First Aid course. 10. Devise an escape route to use during dangerous situations. Determine a central meeting place, should the emergency force the family to disperse. 11. Keep the doors of your home, your garage, and your car(s) locked at night. Ditto for the windows on the lower levels of your house. 12. If you detect something or someone of a suspicious nature, call the police; they are the safety/security professionals. 13. Don’t give your personal information, including your Social Security number to anyone. ID theft scams abound! 1. 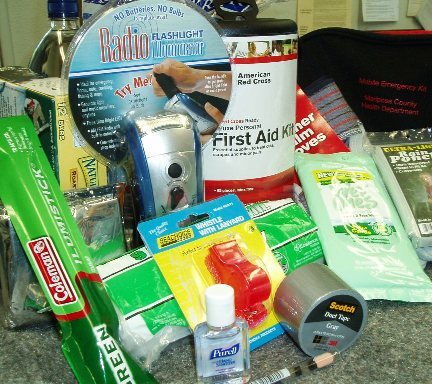 Keep a good first aid full of basic needs such as a thermometer, adhesive bandages, aloe or burn medication, and over the counter pain relievers. Alcohol (the rubbing kind), clean cloths or bandages, and small scissors will round out your inventory. 2. Have the same type of kit ready for your pets. 3. A small box with screwdrivers (regular and Philips-head), pliers, a small hammer, nails, and screws always comes in handy. 4. Keep a few airtight containers in case you need to store clean water. 5. Stock batteries and more batteries. One true emergency can deplete your store, so replace them in a timely manner. 2. If you go out at night, stay in a group and remain in well-lit areas. Steer clear of unfamiliar areas, particularly late at night. With respect to these last preemptive measures, we are in control. For situations created by Mother Nature, we can only be preemptive.